Whether you want to cut through concrete, metal, asphalt, tile, wood – or practically anything else – Sharecost stocks a variety of commercial-grade saws equipped with the right blades. Our staff will make sure you understand the ins-and-outs of any saw you rent, as well as set you up with the proper safety gear. So yes, we CAN help you cut that! Stihl gives you the perfect chainsaw for landscaping, lawn-care, and professional arborist work with this lightweight and well-balanced top-handle chainsaw. It’s lightweight but powerful and well balanced. Note: this rental also requires the purchase of a new saw chain to rent this tool. Chain files, gas, and chain oil are also available. *** This saw also requires the additional PURCHASE of a new chain on top of the rental fee. Set up for wood materials, this portable 10” chop saw is great for cutting 2×4s or 2×6s, and its mitre ability allows angled cuts up to 45-degrees. Powerful motor, adjustable bevel guide. This well-balanced saw is perfect for beam and timber cutting. Our Makita 5402NA circular saw (often called a “beam saw”) has an extremely large capacity blade (16-5/16”) that cuts 6-1/4” at 90-degrees and 4-3/16” at 45-degrees. Popular uses include beam cutting and timber cutting. Features include an electric brake for maximum productivity, powerful 1800 watt motor, low noise level (87dB), blade stabilizer, and easy depth adjustment. Weighs only 28.7 lbs. Rental includes saw, support casing, rip fence, and use of 32-tooth carbide tipped blade. This Hitachi sliding compound mitre saw is light and powerful. Its mitre index features 11 stops, making quick adjustments effortless. Note: rental price does not include blade. Our Hitachi variable speed jigsaw is a lightweight, compact, professional grade saw. The barrel grip design makes tricky cuts a snap! The industry’s first 15” mitre saw, Hitachi’s monster will cut various wood materials, plywood, soft fibreboard, hardboard, and much more. A powerful and easy to operate reciprocating saw. Our Hilti reciprocating saw features variable speeds, orbital and plunge cutting actions, as well as the most simple blade chuck you have ever seen. Lightweight and portable, but still powerful. Our lightweight 10” Bosch table saw powers through most wood materials, and its top will extend in three directions for a generous working surface. This saw will undercut walls, jambs, corners, and toe-spaces, and can fully undercut most installed doors. Wood and diamond blades are available. Keep on cutting with this powerful saw. The Milwaukee 7-1/4” Worm Drive Circular Saw provides the power contractors demand, while offering innovative features designed to make jobs easier. 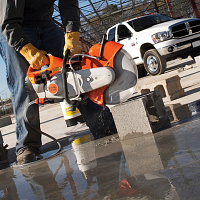 The 15.0 amp, 4,400 rpm motor delivers maximum cutting performance and does not bog down, even under heavy loads, delivering maximum torque in the toughest applications.